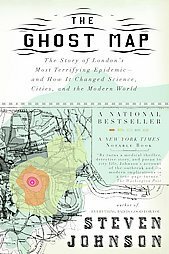 The Ghost Map by Steven Johnson tells a story many Americans know from their high school geography books. During the first half of the nineteenth century the city of London was subjected to a series of deadly Cholera outbreaks. No one knew for certain how Cholera was spread, though people at the time believed in the miasma theory, which stated that cholera was a result of breathing bad air and having a weak constitution. Dr. John Snow believed the disease was spread by contact with human waste through contaminated drinking water. To prove his case, he plotted out the Cholera deaths during The Broad Street outbreak. The resulting map clearly showed that those using the Broad Street water pump were dying from Cholera. The pump was shut down, the outbreak ended, and it became clear to everyone that Cholera was spread by contact with human waste, not by bad air. I doubt that many people will be surprised to learn that their geography books have the story only partially correct. Dr. Snow did investigate the deaths in the neighborhood of the Broad Street pump, he did establish that Cholera was spread by contact with the pump’s water, and eventually this did lead to the end of the miasma theory of contamination. But his famous map was not the cause of it all; rather it was the result, a product of a long term study produced after the outbreak had ended. There is much more to Steven Johnson’s book The Ghost Map. In fact, the map itself plays only a very small part in Mr. Johnson’s story. Like many popular histories, The Ghost Map takes a well known product and examines it from all angles, covers its long period of development, taking a look at a wide range of history along the way. The reader learns much about the development of cities, human evolution and adaptations to urban living, how the Broad Street neighborhood came to be and what it was like to live there in the early 19th century as well as an interesting history of epidemiology and urban plumbing. Much of the book describes 19th century plumbing, both into and out of the many homes in London. This is not reading suitable for the squeamish, but it certainly makes one appreciate just how far civilization has come. There were indoor flush toilets, for example, but they simply flushed waste into the basement or onto the streets in front of people’s homes. Don’t have a toilet or a drain in your sink, just throw your waste out the front door. No matter that the local water pump is right there, separated from a nearby cesspool by just a crumbling brick wall. Enter Dr. John Snow, who really should be a household name. Personal physician to the queen and a pioneer in the use of anesthesia, he followed the spread of Cholera as a sideline. He knew there was little proof to support the miasma theory of contagion but he was almost alone in this belief. He personally went from door to door throughout the Broad Street neighborhood, taking down lengthy interviews with everyone, both victim and survivor, to trace just who drank from the pump and who didn’t and whether or not they later became sick with Cholera. There is some suspense in Steve Johnson’s telling, so I’ll go no further here, expect to say that the results of Dr. Snow’s work, led not only to the end of Cholera outbreaks but to the modern systems of urban plumbing we now enjoy. Say what you will about the water you’re drinking, it does not come from where it ends up anymore. That was not true in Dr. Snow’s day. Towards the end of The Ghost Map the story does begin to run out of steam a bit. Mr. Johnson attempts to bring the issues into the present in his concluding chapters, but this material is not as strong as the earlier historical sections. In spite of this, I found The Ghost Map to be fascinating reading and am giving it four out of five stars. Unfortunately, once again Dakota has struck. She found my copy of The Ghost Map to be a tasty morsel. Ironically, she ate only the first part of the book, leaving the last section untouched. Perhaps we get along so well because we have the same taste in literature after all. I first published this review back in September of 2008. I still recall this book fondly. It’s a very entertaining read. Dakota is still having A-level days, doing well. She has no idea that she is sick nor would anyone who looked at her. We’re taking things day by day. This does sound like an interesting read. I like looking at history from a broad, systematic point of view. It helps when world-building in fiction. And I’m glad to hear that Dakota is having good days. My parents had a keeshond that ate the spines off any books at nose level. Considering my mom’s book habit, that was a lot of fiber in his diet. It sounds interesting, if I could stomach the details. Maybe someday. I agree with your assessment. The last bit about the miasma was boring (in my opinion)…. I am glad to hear that Dakota is having good days! I don’t remember ever learning about this in school, and I just found the book fascinating (though I agree about the last chapters). And after reading about cholera for years, I finally understood what it was. I read this around the same time as The Suspicions of Mr Whicher, and they went well together. I do think this is one of the best popular science books I’ve read, though that bit at the end was quite disjointed. Glad to be reminded of this again.